After getting pre-approved for an auto loan, Lindsey Mason bought her first vehicle on her own. But the college student’s excitement over the monumental moment was short-lived. After she already had her new car, Mason’s financial institution told her she was too high of a lending risk because of her lack of payment history. She was no longer approved for the loan unless it was accompanied by a down payment or a cosigner—neither of which was an option for her. That’s when Mason reached out to Collin Olson, at Dupaco Community Credit Union’s San Marnan Learning Lab in Waterloo. 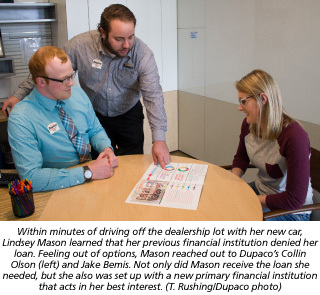 By the time Mason arrived at the credit union, Olson and Dupaco’s Jake Bemis were already working on a solution. Dupaco opened an account for Mason and approved her for an auto loan, matching her previous financial institution’s rate and terms—with no co-signer required. “They saved me and my new car, and I was able to walk out of there with a check in hand to take to the dealership,” she says. Mason also walked out with a new primary financial institution. Not only did Mason receive the loan she needed, but she also was set up with a Dupaco Visa credit card to help her continue building her credit to become financially independent. “I just loved the fact they were doing everything they could to help me and my financial situation,” Mason says.